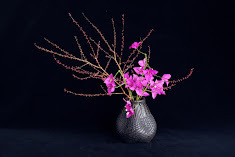 Learn Ikebana online. Send a photo of your work to shososhimbo@gmail.com to receive expert's feedback. 1. The relationship between A and B is not clear. 2. Roses are too central ( C ) and consequently too static. 3. D and E do not correlate. Q: Can you elaborate the third comment? A: Ikebana seeks harmony out of the unbalanced elements. But if the unbalance is too large, it is hard to achieve harmony. Unbalance between D and E is too large. Well done. This is much better! Reworked branches on the right hand side are so sharp and so alive! Adding white chrysanthemum made this work so interesting. Massed flower form is nicely irregular and it created good contrast to fine lines. This work is about tell a story, but not yet. A. Find a better point to finish this line. B. Don't make a gap here. C. This branch spoils all of your effort! Meditate to find a better way. You may move it or replace it to softer lines or remove it completely. a multiple ticket for 5 feedback (Aus $80). The single ticket is valid for 1 month and the multiple ticket is valid for 1 year. 2. Send an email to shososhimbo@gmail.com to request online Ikebana lesson tickets. Please include your name, phone number and type of ticket you want. 4. Transfer your fee. Fill in your name on the reference section. 5. You will receive an email to confirm your payment. 6. Please resize your photo to under 1 Mb and send it to shososhimbo@gmail.com. Each submission may include up to 3 images, views from front, right and left. One Ikebana work per submission. Please include your intention or the topic of your work to receive more specific feedback. 8. We would like to share your work with other students in our blog or facebook. If you don't wish your work to be published, however, please indicate so every time you send your work. Q: Who is this service for? A: This service is for those who have done at least a basic Ikebana course in any school. For those who have not done any Ikebana course, our online Ikebana introductory course will be available sometime soon. Q: What kind of work can I send? A: Any Ikebana works. They can be either basic styles or free styles. Q: What kind of feedback will I get? A: Please see some samples above. Our suggestions are usually not very specific. They tend to be something like, "Find a better position for this branch" rather than "Cut this branch at this point". Final decision is up to you. There is no perfect Ikebana work for anyone. Our goal is to help you achieve your personal best. Learning Ikebana takes time because we are training your aesthetic sense through meditation. Learning Ikebana is quite different from learning, say, computer programs. See an article by Shoso. Q: Will I get mean and negative comments? A: Sorry but that may happen, although that is not our intention. Our goal is to encourage and support your study of Ikebana. However, probably many of you have some negative experiences using emails. Unlike face to face interaction, written communication tend to cause some misunderstanding. Especially when we see your potential, we get excited and our comments tend to be strong. Be patient with your teachers. Q: After I received your feedback, I made some changes to my work. I would like to send the image of the revised work to get more feedback. Do I need to use another ticket? A: You may resend your revised work and you will receive a very brief comment such as Good Work. This second feedback is free. However, if your revised work is very different to your original work, we may suggest that you seek more advice. To receive the third feedback you will need to use another ticket. Q: Can I get a credit toward certificates by using this service? A: No at this stage. Please regard this service as companion or supplement for your Ikebana study. Q: Can I ask if I don't understand your feedback? A: Yes. Send an email or phone. Q: Can I publish or share the comments I revceived? A: Please regard our comments like private emails. Please ask permission before you share to others.